Imogen top. 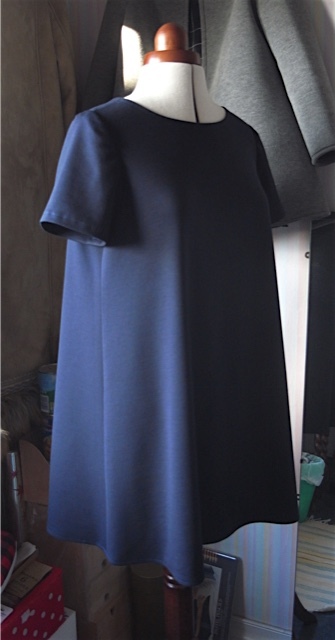 But this time I’ve lengthened the bodice by 8cm and the sleeves by 11cm, and it now it is perfect for me. PERFECT! I still enjoyed the making process though for this top. Maybe its about doing something different and challenging myself. Might have to give that more of a try next year, but I can see this pattern in so many various ways. 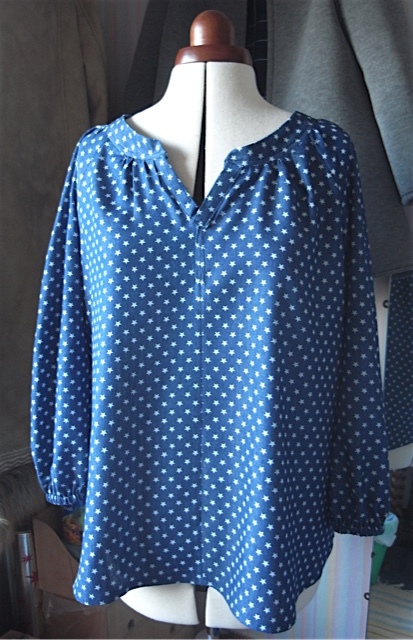 Think it would make a fabulous dress , or long tunic over jeans. 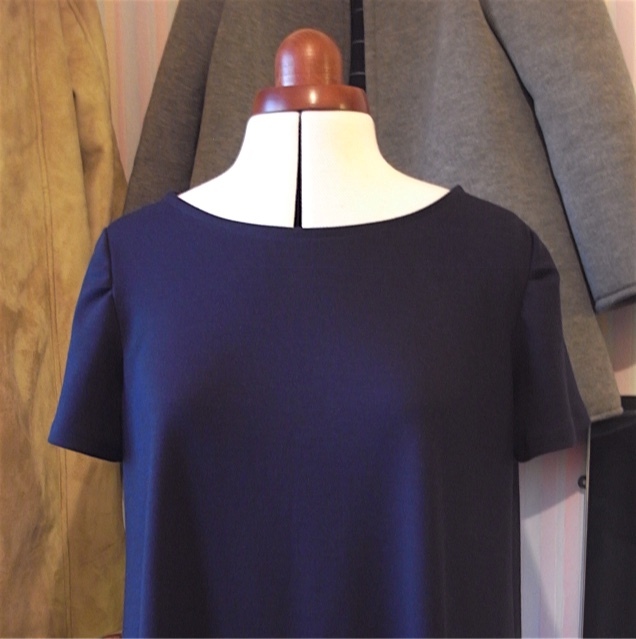 I already have a short sleeved black crepe dress version in my head, watch this space. I wore it to my Dad’s 80th Birthday lunch and had a few compliments on it, and not one person asked if I made it. Which makes me think it looked that good it couldn’t possibly have been made by me! Yep, thought it about time I had a go at something different. Think I’ve made enough Trapeze tops for now! 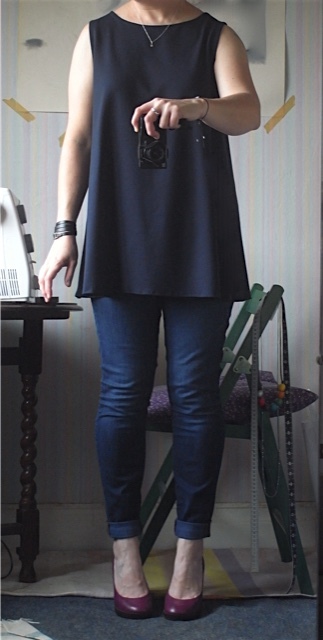 I fell in love with the Imogen top from sew me something, as it had a neckline I liked. 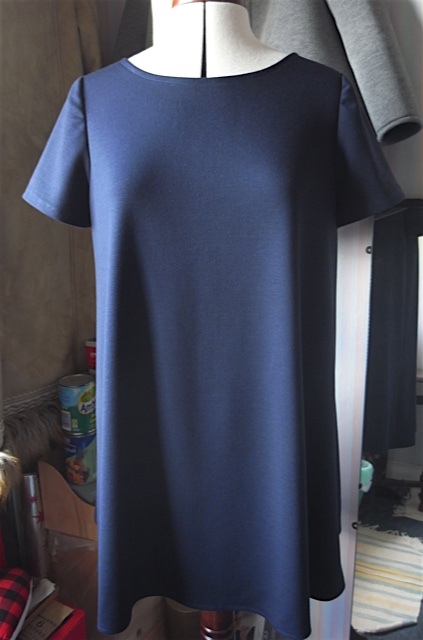 However The neckline turned out to be a bit of a challenge. The pattern says its suitable for beginners, however I beg to differ. I do have sewing experience now, but I feel if I’d tried this as a beginner I would have packed up my sewing machine and just stopped. I feel the instructions could do with being a little more detailed and more pictures wouldn’t go amiss either. So despite the experience I do have I still managed to bugger it up! I was able to rectify it though. Totally forgot to take pictures of the buggered up version, as I was thinking it was a right off and was feeling very despondent, I really liked the fabric and was unhappy about the waste. And then I checked in my scrap pile and found I had enough scrap left over to give the buggered up bit another go. Basically I put the collar on upside down, simple mistake to make, I was looking at it like a facing as thats what I’m used to. I unpicked the upside down collar and started again. Of course I had to compensate for some fabric that had already been cut off, but it worked out fine. I also had a little problem right at the start with the placket not fitting right. There’s a little V like cut out in the neckline and I believe when I cut the fabric out I must’ve somehow made the bottom of the V a bit wider than it should have been (if that makes sense?) 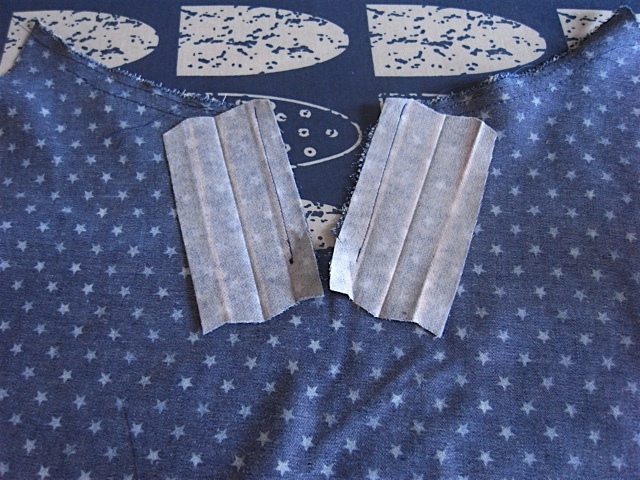 And once I’d attached both the plackets they didn’t overlap like they should. I was almost ready to give up at the first hurdle. And then because I thought I’d ruined it already I thought why not cut it down the middle through the centre of the V and put back together with a small centre seam? Why not indeed! So thats what I did, and it worked. So I carried on. 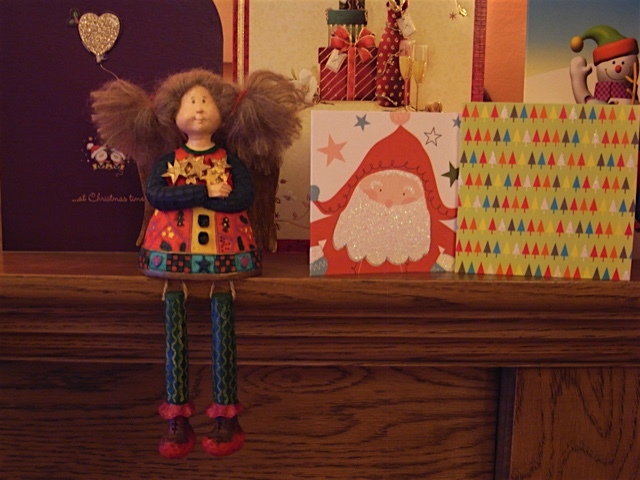 Which partly made me more determined to sort out the upside down collar situation. 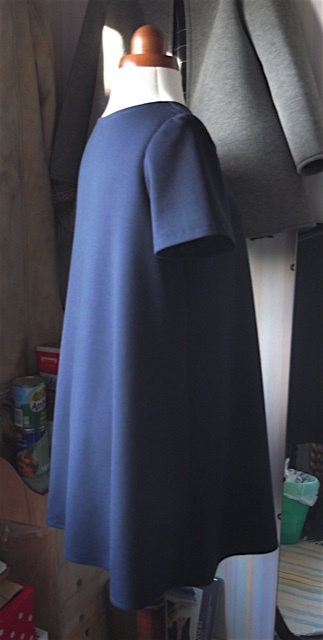 I was able to get a UK size 12 out of 1.5m of fabric. Below is the placket situation before I sorted it out. 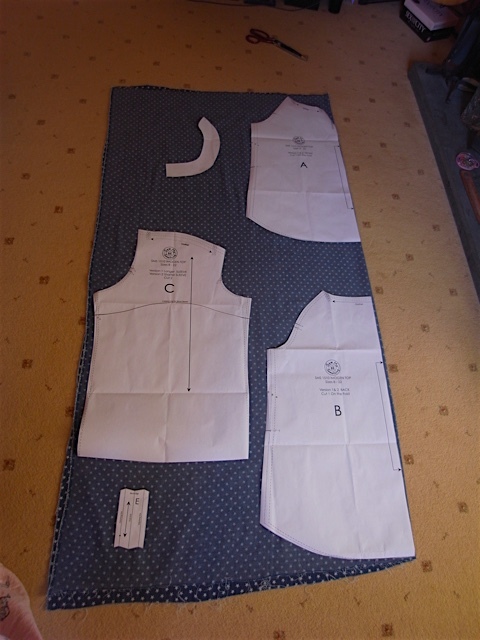 As you can see the placket pieces do not in anyway shape or form meet or overlap. Ta daa! Here it is, and I love it. Despite all my problems with it, I thoroughly enjoyed making this top. I learned several new things, not least how to insert elastic to make the sleeve cuff. It also had a different technique for sleeve insertion. See what I mean about the lovely fabric. 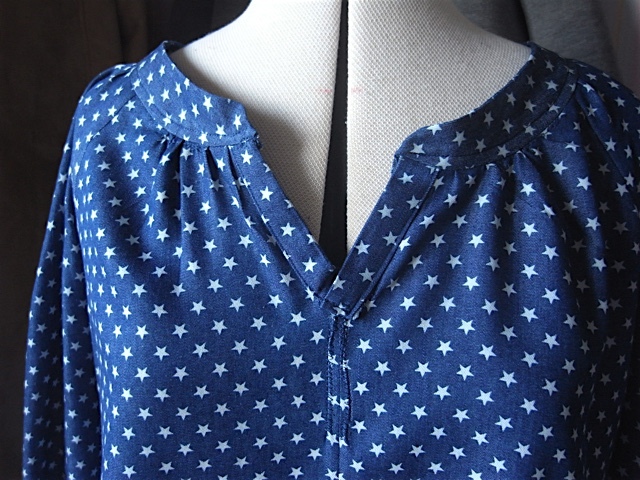 Its a cotton denim coloured chambray with little stars on it. It wasn’t expensive, I just really really liked it. And didn’t want it to have been a waste. 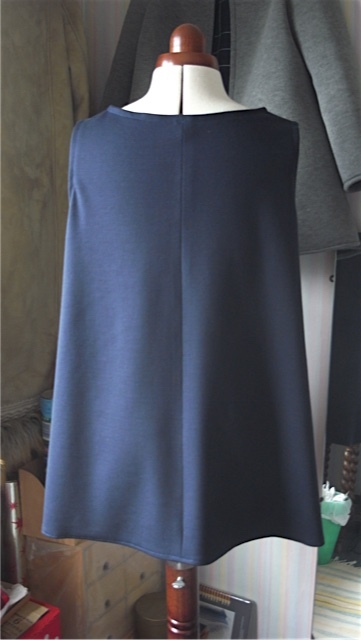 It has a lovely curved hem, and here you can see the elasticated cuffs too. In the picture below you can see little more clearly the slight mess of the plackets and that the collar still isn’t quite perfect. I had to zigzag the seam at the base of the placket neck opening as the seam wasn’t quite big enough for me to finish it off properly on the edges, so that looks a bit messy, but I can live with it. 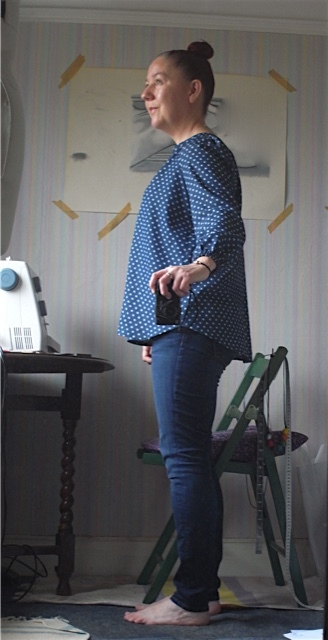 Also the placket isn’t sitting quite right, but again I can live with it. I also made the row of stitching that anchors the bottom of the collar to the bodice a little too high from the neck seam. I think it looks Ok and again I can live with it. The top is perfectly wearable and after giving it a good press the neck sits pretty nicely. So I had some of the navy jersey left over. 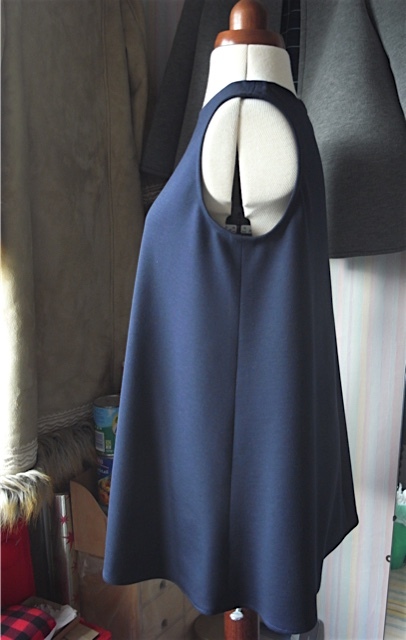 It was just enough to make a sleeveless top, which was somewhere in length between the tunic top and the regular top. Now I’m not too keen on the sleeveless look on me any more but I just couldn’t waste that amount of fabric so I had to go for it. I could only manage to get a top out of the amount of fabric I had left because its jersey and doesn’t need a facing of any kind. 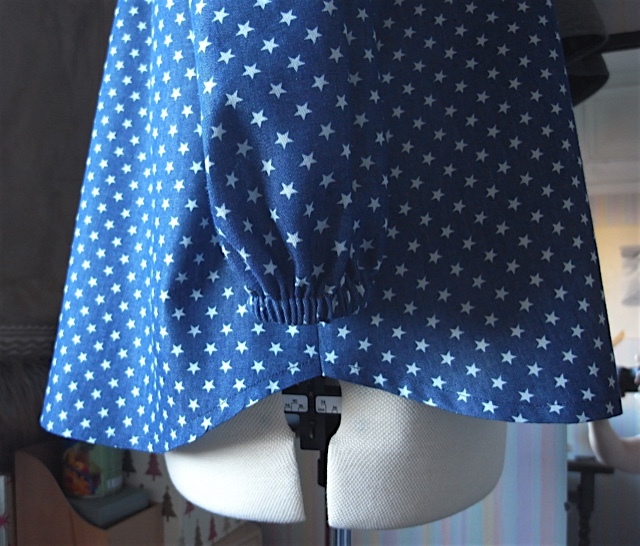 and I do so love the seams don’t need finishing, as it made for a really quick make. 3 hours in total. 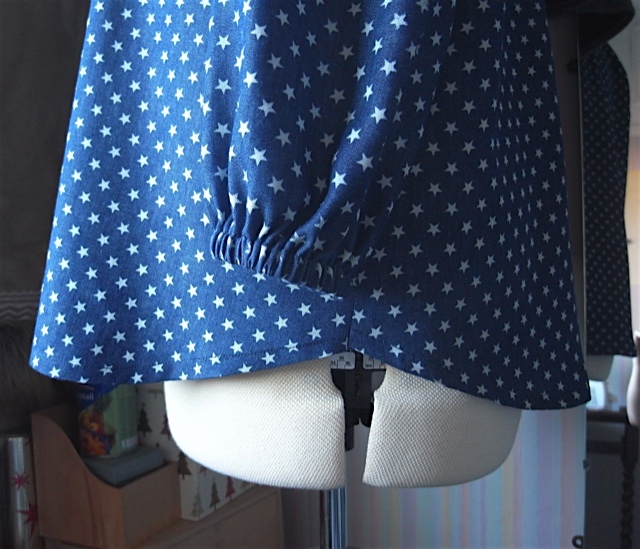 I simply folded over the edge of the armholes and the neck by 1.5cm and sewed in place. I know a lot of sewers frown on this, but I say if it works why not? It hangs really nice. Its a lovely weighty jersey. Apologies for the headless pics, but had really bad bed head hair! 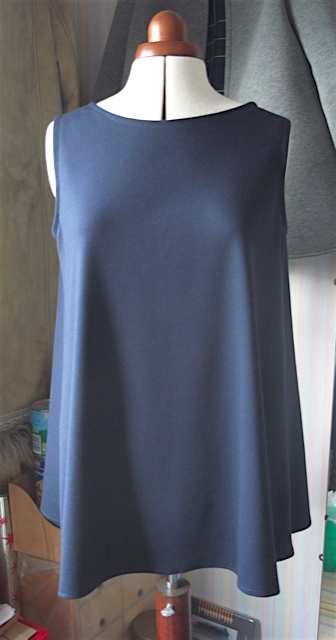 I’ve decided I don’t mind sleeveless on me when its in a plain fabric and a certain length. I think I might even try a sleeveless dress for summer. 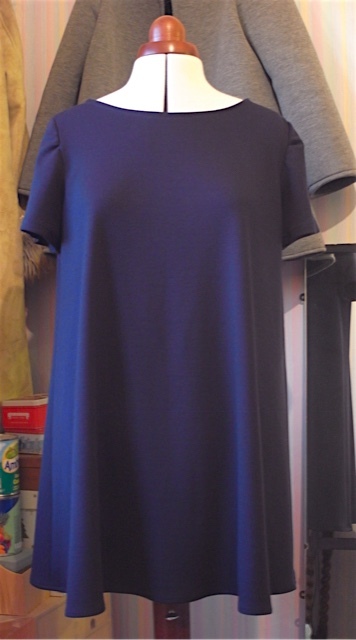 Lovely lovely lovely navy jersey that is! 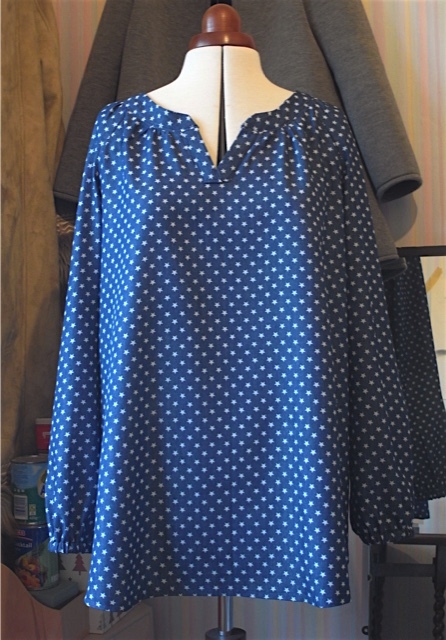 I have Tweaked the Trapeze pattern again and now have the perfect length for a mini dress or a tunic top. 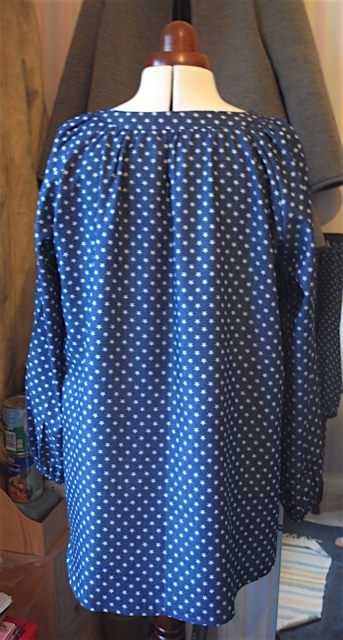 The last post was about a mini dress this one is about a tunic top. 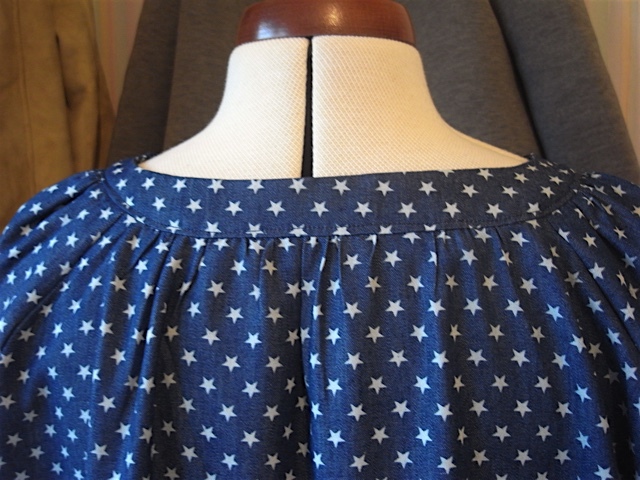 Giving it a very small hem this time as this jersey fabric didn’t sit too well without. 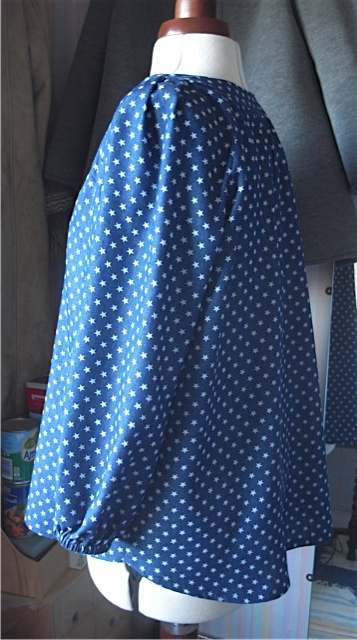 I’ve made two now, the first one was Ok but the sleeves puckered up a bit, its wearable but not great. See those two giant tucks in the sleeves. I tried unpicking the sleeve on the left and redoing it, which improved it a bit. It was far worse before. The rest of it worked out fine though and I love the length. 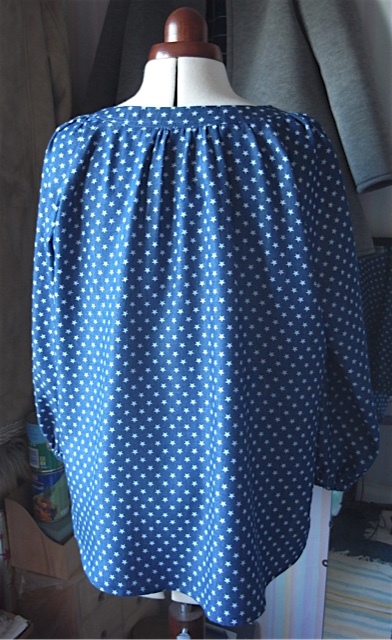 Looks perfect with jeans. 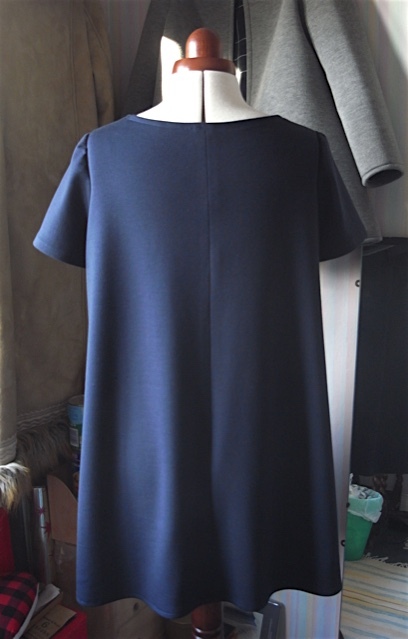 And below is the slightly better one, sleeves still not quite perfect but looks much more acceptable. The fabric was lovely to work with and feels gorgeous against the skin. Fabric came from Fabric godmother and was I think £14 a metre, quite pricey but it is quality stuff. I bought 3 metres of it and managed to make 3 items from it, so worked out quite cost efficient in the end. Works well with my jacket too. Wore it for a day out in London recently. Was very comfortable.